According to the most recent incidence data, approximately 3.5 million cases of non-melanoma skin cancer (NMSC) are diagnosed each year, affecting 2.1 million people in the United States alone (Rogers et al., Arch Dermatol 146:283–287, 2010). Basal cell carcinoma (BCC), squamous cell carcinoma (SCC), and squamous cell carcinoma in situ (SCCIS) represent the overwhelming majority of NMSCs, with BCC and its subtypes being the most common malignancy affecting Caucasians (Rogers et al., Arch Dermatol 146:283–287, 2010). Traditional treatments of NMSCs include standard excision, Mohs micrographic surgery, curettage and electrodessication (C&E), cryotherapy, radiotherapy, and topical cytotoxic therapy (e.g. fluorouracil). Some patients, especially those with multiple lesions, may not be amenable to several destructive or surgical interventions due to multiple comorbidities or fear of disfigurement, while others may be unable to tolerate the inflammatory side effects of topical preparations. A less invasive modality with fewer adverse effects and comparable efficacy is needed in certain patient populations, and to this end, lasers have shown great promise in carefully selected patients. 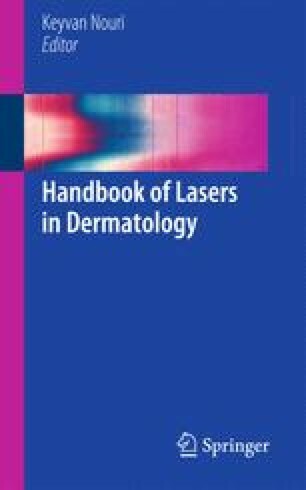 This chapter will address the indications, procedural techniques, pre-operative and post-operative considerations as well as the prevention and management of complications when using lasers for the treatment of skin cancer.